In 2015 alone, more than 21,000 women will receive a diagnosis of ovarian cancer and approximately 14,000 women will die of the disease. Often diagnosed at advanced stages, ovarian cancer is aggressive and particularly tough to treat. Women may initially respond positively to chemotherapy, but the benefits seldom last. About 80-85 percent of people with ovarian cancer will relapse or develop chemo-resistance, according to the American Cancer Society. The immune system is a powerful tool in the fight against cancer. With the right therapies, our body’s built-in weapon can target and kill tumors. But not all cancers are created equal. They all express subtle variations of surface molecules – called cancer antigens or proteins – making them elusive and unpredictable. Immunotherapy clinical trials have yielded standout results, including partial and complete remission in patients with some types of advanced cancers. Unfortunately, cancer cells evolve, get smarter, and learn to evade or suppress the immune system over time. So, once beaten back by the immune system, how long do these advanced cancers remain at bay? Dr. Odunsi, left, and a colleague in the lab. Photo courtesy of Roswell Park Cancer Institute. 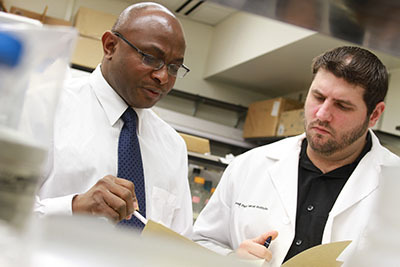 Kunle Odunsi, MD, PhD, chair of the Department of Gynecologic Oncology, executive director of the Center for Immunotherapy, and deputy director at Roswell Park Cancer Institute (RPCI), Buffalo, New York, is determined to find out. He and his team spent the last decade studying how to generate better, longer-lasting immune therapies to treat advanced ovarian cancer – a difficult disease with a grim prognosis. To support these efforts, the New York State Stem Cell Science Program (NYSTEM) awarded the team an $11.8 million grant for continued research. These funds demonstrate the urgency to find innovative ways to eradicate this deadly disease. In this blog post, Odunsi, who has been a member of the American Association for Cancer Research since 2002 and currently serves on the editorial board for the AACR’s journal Cancer Immunology Research, takes us inside the lab and explains some research that has the potential to improve the lives of ovarian cancer patients. Can you tell us about your recent studies and findings in your efforts to advance our understanding of ovarian cancer? Cancer-testis (CT) antigens are expressed in a variety of cancers, but not in normal adult tissues, except for germ cells of the testis, and hence appear to be ideal targets for immunotherapy. We have focused on the CT antigen NY-ESO-1, as a prototype tumor antigen for human cancer vaccine studies because of its unique characteristics of tissue restricted expression and inherent immunogenicity. This notion is supported by the observation that although NY-ESO-1 is expressed in up to 40 percent of ovarian cancers, spontaneous immune responses are found in only a fraction of patients. Thus, eliciting vaccine-directed immune responses against this antigen may result in clinical benefit for ovarian cancer patients. To test the clinical benefit of a vaccine regimen targeting NY-ESO-1, we conducted a phase II clinical trial of epithelial ovarian cancer (EOC) patients with advanced disease who were at high risk for recurrence/progression. Integrated NY-ESO-1-specific antibody immune responses were induced in a high proportion of these patients. Median progression-free survival was 21 months and median overall survival was 48 months. These results demonstrated a clinically meaningful benefit for vaccination in ovarian cancer and further supported our continued work targeting NY-ESO-1 specific responses in this patient population. We also tested in a separate vaccine trial whether providing cognate helper CD4+ T cells would enhance the antitumor immune response. NY-ESO-1-specific CD4+ T cell responses were induced by vaccination in a high proportion of EOC patients. Long-lived and functional vaccine-elicited CD8+ and CD4+ T cells were detectable in some patients up to 12 months after immunization. These results confirm that the provision of cognate CD4+ T cell help is important for cancer vaccine design and provided the rationale for the planned NY-ESO-1 directed immunotherapy trials in patients with EOC. Can you tell us about your hypothesis of utilizing patients’ stem cells to target ovarian cancers using an immunotherapy approach? We hope to improve the odds for ovarian cancer patients by using an immunotherapy approach known as adoptive T-cell therapy. It is a novel treatment that, if it works, has the potential to forever change the way we approach ovarian cancer management. T cells, a type of white blood cell, attack foreign invaders in the body – this includes tumors, bacteria, and viruses. But cancer cells are resilient and sometimes overpower the body’s army of fighter T cells. To combat this, we plan to tap into the long-term, regenerative power of stem cells. We have found in preclinical humanized mouse models that with some manipulation, we can turn these stem cells into billions of cancer-fighting immune cells. In our preliminary studies, we re-eingineered human CD34+ stem cells and administered into humanized mouse model. When these human stem cells developed, they retained the markers of human background and expressed the receptor required to recognize human tumor cells. This is the scientific principle behind the planned clinical trial. It is a promising approach, not only to control existing disease, but also to potentially prevent future relapse of the disease. The goal is that once the re-engineered human CD34+ stem cells are infused back into the body, they lodge in bone marrow and become a potentially life-long source of cancer control. Where does this study currently stand? The preclinical data show that human hematopoietic stem cells (hHSC) isolated from adult peripheral blood can be re-engineered to differentiate into/become mature T cells with the capacity to recognize and kill tumor cells in vitro. In a humanized mouse model, hHSC engineered to express a novel tumor-recognizing NY-ESO-1 specific T cell receptor (TCR) were detectable in circulation and within lymphoid organs. We are currently testing the anti-tumor efficacy in the same human mouse model of peritoneal ovarian cancer. The dose and timing of transduced hHSC to administer is under evaluation. The NYSTEM investment will allow us to conduct additional preclinical studies and the first clinical trial. How will this therapy impact the lives of ovarian cancer patients? Based on previous data, we hypothesize that the treatment will be effective against any type of ovarian cancer that expresses the NY-ESO-1 antigen target. So, there is huge potential to impact a broad range of patients with this disease. And because NY-ESO-1 is so widely expressed by various malignant tumors, the approach may have an application in the treatment of other cancers. How will this therapy evolve over the next few years? The NYSTEM grant will support the first clinical trial to utilize adult HSCs in cancer immunotherapy. Preclinical IND-enabling studies are underway. When these are completed along with FDA/IRB approval, this trial will be activated at RPCI. The data thus far demonstrate that HSCs can be reprogrammed to mature and grow into functional antitumor immune cells that stay in the body for a long period of time resulting in improved tumor control. We hope that this stem cell approach will initially treat patients who have failed standard therapies, such as chemotherapy. In the future, we anticipate that it may also be used after remission to minimize the risk of relapse. But what about the 60% of us with EOC (including me) who do not express NY-ESO1? Please recognize the majority.